Everywhere Lucas Hedges lands, turmoil and trouble and pain follow. Not Lucas Hedges the wonderful young actor, mind you. We’re talking about the characters he’s played. In “Manchester by the Sea,” Hedges received an Oscar nomination for his work as a 16-year-old left without a responsible adult guardian after the death of his father. In “Three Billboards Outside Ebbing, Missouri,” he was a teen deeply traumatized by the murder of his sister. Just last month in “Mid90s,” Hedges was a lonely, surly teenager with serious anger management issues. Next month, as the title character in “Ben is Back,” he’s a drug-addicted teen home from rehab. Writer-director Edgerton plays program director Victor Sykes, who runs the place as equal parts boot camp, rehab facility and detention center. (Sykes himself once strayed as a young man, but now he’s “cured” and he is determined, one might even say obsessed, about righting the wrongful paths of others.) Clients — I guess we can call them clients, given their parents are paying thousands of dollars for the treatment, which can take a few days, or a few weeks, or many months — must participate in drills such as sketching out an extended family tree and listing the sins and bad habits of parents, grandparents, aunts, uncles et al., that might indicate “faulty” DNA. If your dad was a heavy drinker and Grandpa served time for robbery and confirmed bachelor Uncle Joe always seemed a little “funny,” well, that type of weakness in the family might explain why you’re acting out and claiming to be a homosexual! There’s role-playing, with Sykes berating the kids, breaking them down, pressing them to admit they hate their fathers, regardless of whether it’s true. When a young man sits in an “unmanly” way, Sykes screams, “Uncross your legs!” There’s a trip to the batting cages, where Sykes mocks the guys who can’t hit. It’s madness and it’s cruel and our hearts break for these men and women, many of whom are vulnerable and bruised (emotionally and in some cases physically) and desperate to become “normal,” so they be accepted by their families and forgiven by the Lord — or at least the Lord as channeled through the righteous Sykes. It’s also based on true events. “Boy Erased” is an adaptation of Garrard Conley’s memoir about his teenage years in Arkansas, when his Baptist parents sent him away for gay conversion therapy. (PLEASE stick around for the closing-credit updates on how the real-life story played out.) Like the earlier 2018 release “The Miseducation of Cameron Post” (featuring superb work from Chloe Grace Moretz), it presents the story without being overtly political or (for the most part) too heavy-handed in the depiction of the authority figures who firmly believe homosexuality is a morally corrupt choice — and they can “fix” these individuals. 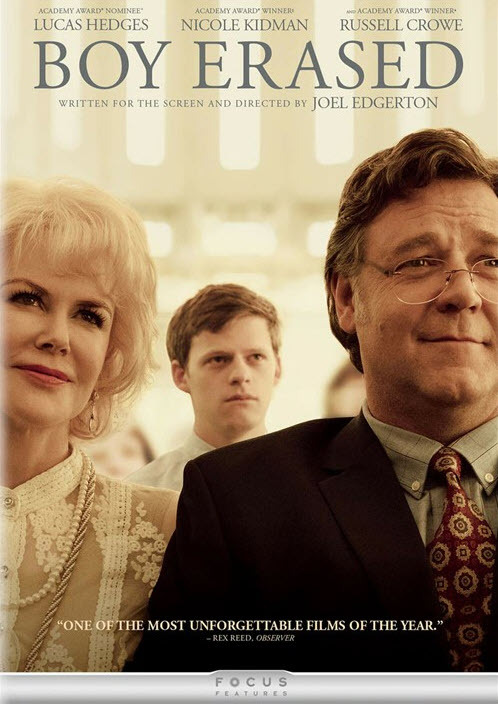 To its great credit, “Boy Erased” never reduces Jared’s parents to monolithic, backwards-thinking caricatures. Crowe’s Marshall is a thoughtful, old-fashioned and of course deeply religious man, and his world is rocked to the core by Jared’s revelation — but we never doubt Marshall’s love for his son. Kidman’s Nancy goes along with the conversion therapy plan, but from the beginning it’s clear she has misgivings about the so-called experts at Love in Action and will step in if she feels someone is hurting her son. This is Jared’s story and Hedges is the lead, and on the heels of his outstanding supporting work in those aforementioned films and to little surprise, he proves capable of shouldering the heaviest lifting. But it’s also something special to see the veteran Oscar winners Crowe and Kidman disappearing into their characters and delivering such fine and beautifully crafted and truly moving work in this understated but impactful film.